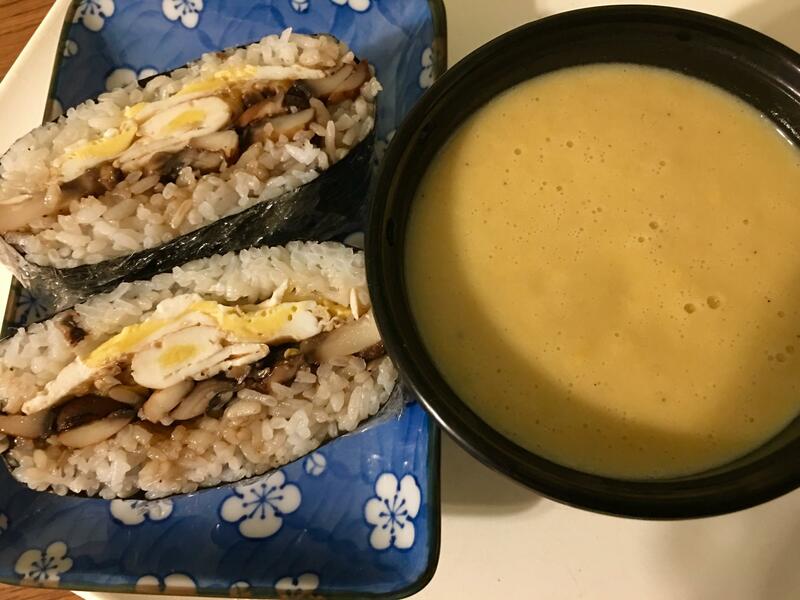 Egg and mushroom onigirazu with a bowl of corn potage. Leftover chuck eye steak and roasted asparagus, with plenty of mayo and horseradish on Aldi white bread. 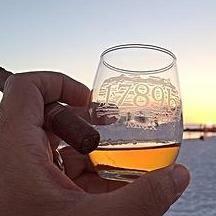 It was already half gone by the time the photographer arrived. 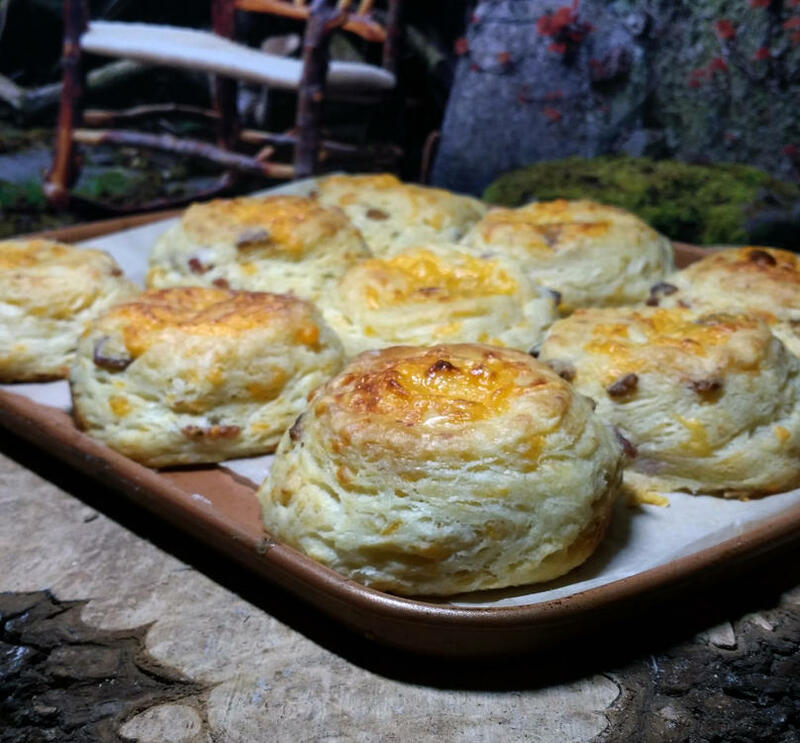 Made Moe Cheddar and Bacon Biscuits for breakfast this morning. 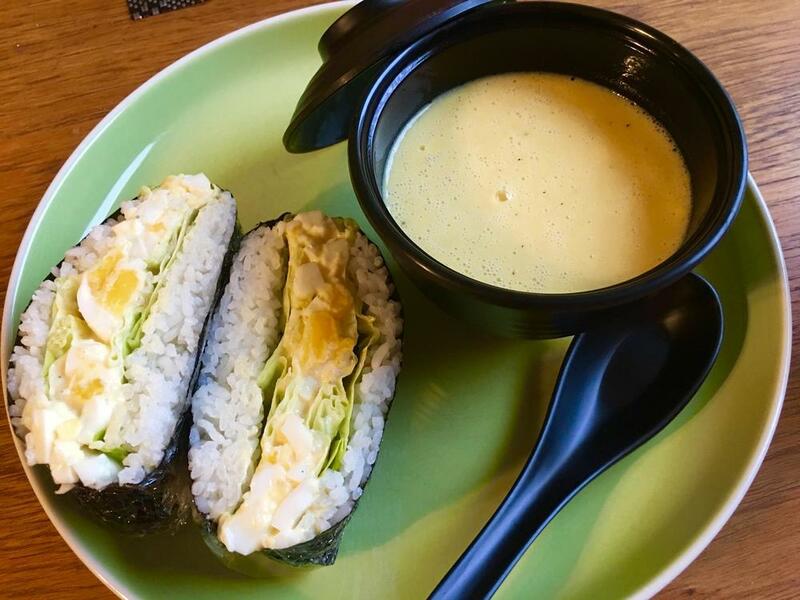 The last of this batch of corn soup and a miso-mayonnaise egg salad onigirazu. 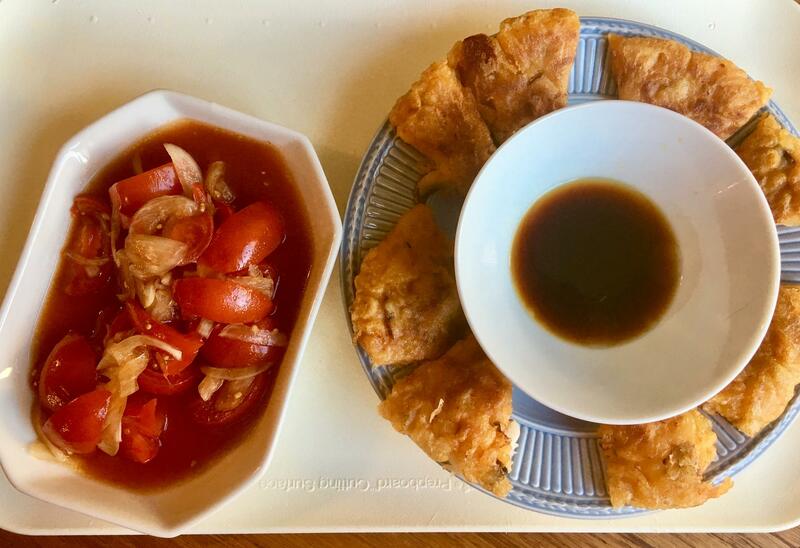 Tomato and onion salad dressed with soy sauce, rice vinegar and sesame oil, and a kimchi pancake (one of my better executions of this dish) with dipping sauce. The bread (Glenn country rosemary batard from Roan Mills) is spread with a mix of mayo & za'atar before cooking. It was sort of an oblong shape so I used little peewee eggs to make two small toads instead of one in the middle. Per the book, this is served with a simple tomato and scallion salad dressed with lemon juice and olive oil. How many of us remember this? I ask because presently I find myself taking this challenge involuntarily. Due to some uncertainty about the next few days, I am delaying grocery shopping as long as I can so that things don’t wither/rot away due to circumstances beyond my control. This morning, faced with a scarcity of standard items usually in my fridge or freezer, I resorted to frying up some sliced pepperoni as part of the filling for my breakfast sandwich. 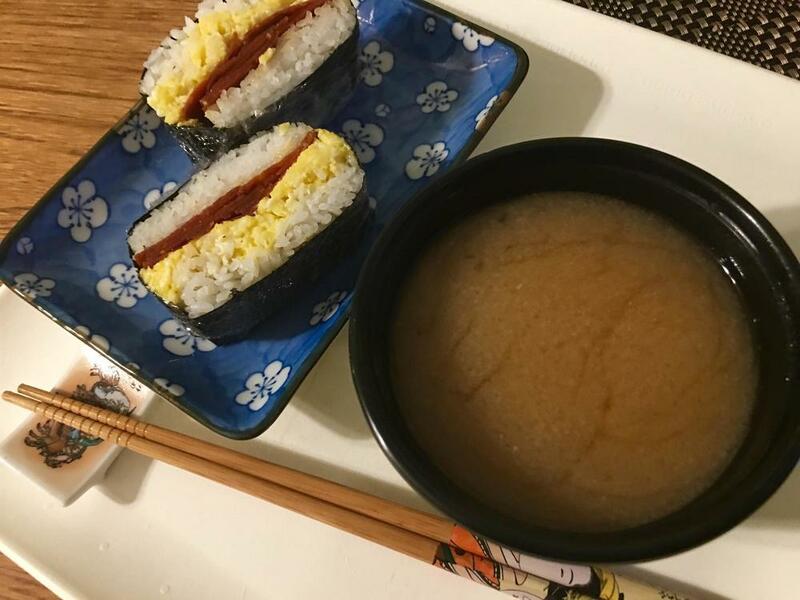 Scrambled egg and fried pepperoni onigirazu and some “instant” miso soup made with miso-maru. 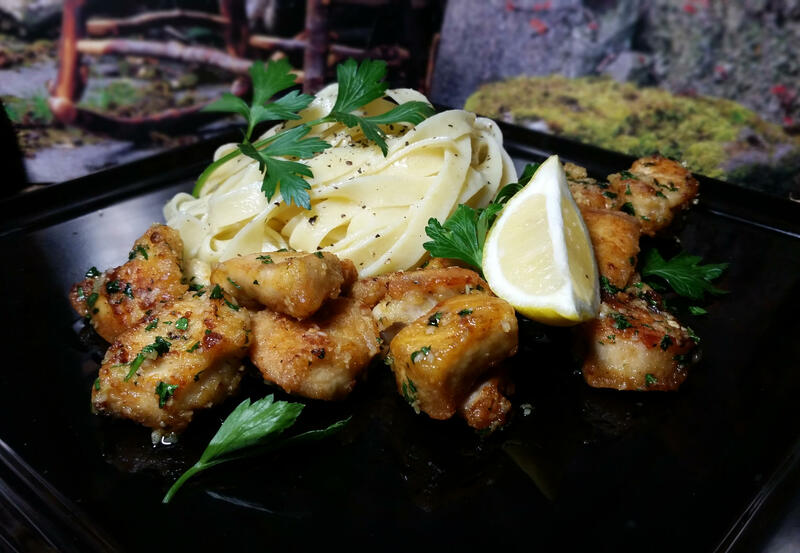 I had intended to make Jacques Pepin's Chicken with Garlic and Parsley for dinner last night but it became breakfast this morning instead. 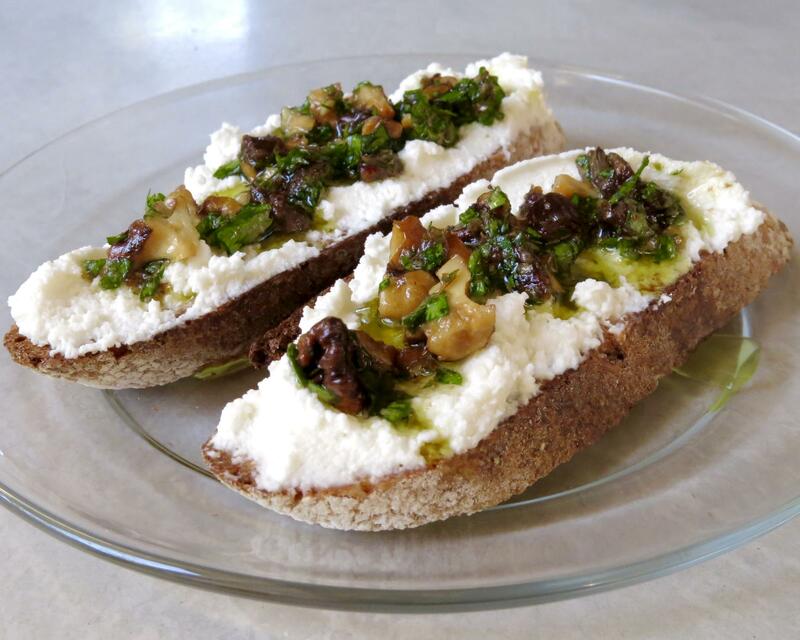 Today's breakfast consisted of these toasts spread with ricotta and topped with date & walnut pesto that I posted over in the crostini topic. A bit chilly this AM so I warmed up a bowl of the Zuni Café Roasted Applesauce that I made the other day and had a couple of spice wafer cookies on the side. My apologies to @Anna N and anyone else who takes exception to my penchant for scrapple. 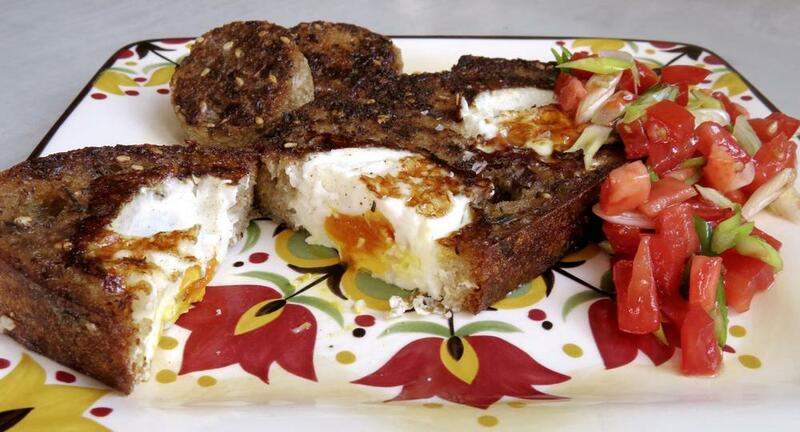 Every once in a while, after my father had gone to work, my mother would retrieve some scrapple from wherever such contraband was stashed in our house and cook it up, explaining how she had learned to love it in Baltimore, as a child. It was during those times that I learned to love it in Connecticut, as a child! Today it was time to process another batch, I had gotten from the freezer (where I keep my contraband) just days before. Then, it was time for breakfast. I paired it with some fried zucchini (apologies to @rotuts, as well) and a few over easy eggs, some hot sauce and fresh salsa. Wonderful story and memory! One of the things that I love about eG is this kind of sharing. Our histories of how and why we love food are fascinating. This is something that former eG'er @racheld was so exceptionally good at. Thank you for sharing that. After a long trip, I returned home to an empty fridge. 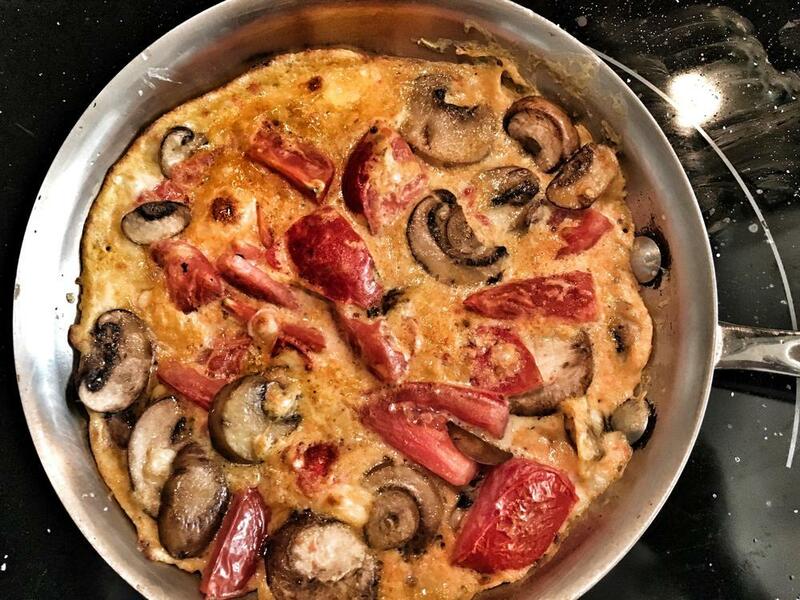 I had to make a quick run to the grocery store so I could get some essentials, including the ingredients for this frittata. it looks like any good quality FR pate might. It's the visual that does me in. Reminds me too much of souse meat, which I could not eat because I watched it get made in the big kettle when we killed hogs when I was a kid. I have gotten over many childhood aversions. That is not one of them. That is very interesting because it was my love of scrapple and my love of the Naam Khao Tod at my absolute favorite restaurant in Las Vegas, Lotus of Siam, made with fermented sausage, that made me decide that I would love to try souse, and perhaps make some myself. I worked in commercial kitchens for years, and learned, early on, that averting your eyes was never a good idea in that environment. A reprise from a snack last night - Pepperidge Farm cranberry swirl bread, a smear of Miracle Whip with a sprinkle of celery salt on one side, cranberry sauce on the other and some thinly sliced turkey. Don't know why but it hits all my taste buttons. 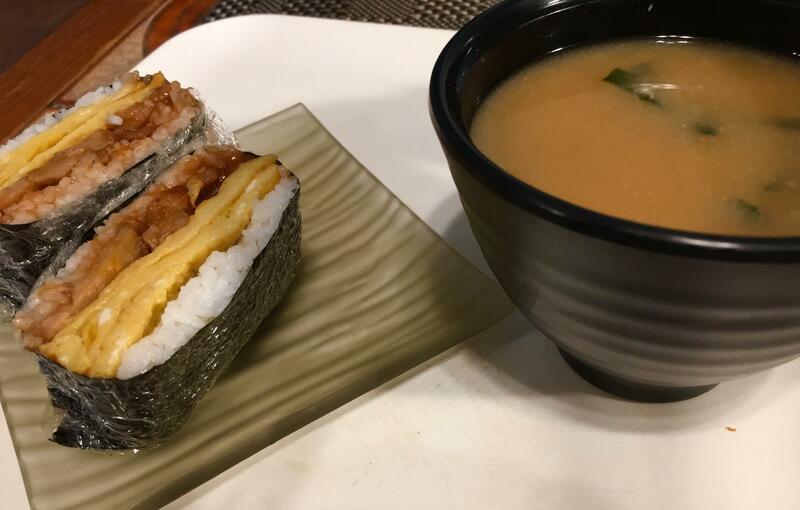 “Instant” miso soup and a small onigirazu with sliced, leftover teriyaki chicken ball and a simple omelette. I have found that a 7 inch square of nori and ~ 95g cooked rice makes for a compact and less filling sandwich. I forget how good egg sandwiches are on a soft, toasted bun. Need to do this more often. I love Popeye's biscuits and I wish they were open for breakfast.